I'm not asking you to buy your underoos second hand! Go ahead and stock up on new things you need like socks, underwear, necessary clothing replacements and/or craft supplies you use often before you begin. If you're a shopaholic with impulse issues, avoid retail temptation. Don't worry, once your challenge is up retail junk won't even interest you anymore. Set the dates you'll begin and end your challenge and stick with it! Ask friends, families, and neighbors for a needed supply before you buy it. Stretch creativity and use what you have on hand for projects. Use up duplicates (like those extra bottles of shampoo under the sink) before buying more. On Exceptions... Necessary purchases for your business are exceptions to the Buy Nothing New rule. I also allowed myself to occasionally dine out (local joints), travel, and purchase souvenirs. Maybe a daily Starbucks frap is your necessary evil; every list of exceptions will be different. Adjust this challenge to suit your lifestyle. Shout Out: For daily inspiration you must read Katy's entertaining blog The Non-Consumer Advocate, a whole site dedicated to living a resourceful retail-free life. 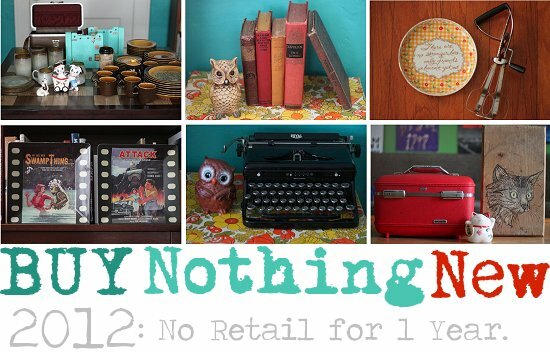 Check out her personal buy nothing challenge. Could you go one year without retail shopping? Are you already living a retail-free life? I buy new when it suits me. I spent $25.00 on jewelry at Catherine's when the $24.00 sets were clearanced out and marked down to $2.50 each. But I really prefer to thrift everything. I always feel a little like I failed when I have to buy new. Jeanne: I did have to give in to retail for a big wall calendar, some things you just can't find 2nd hand. Besides, sometimes retail items on clearance are far cheaper than what you'll find at the thrift- damn those rising thrift prices. These are the people that sell the stuff that gets damaged and thrown out otherwise. I've been buying nothing new (with a few exceptions) since 2007, so I'm starting out on year five. It is so much easier than one would think. Katy: It's a pretty easy lifestyle change because you still get your shopping kicks at the thrift store. The challenge of hunting for what you lack actually makes it funner. I made this my challenge last year from you, I applied it mainly to gifts, but slowly extended it to everything. Only today I was talking about Thrift Pledge to my friend as she was aiming for something similar, I have forwarded this post to her. She's up for the challenge as am I, thank you! Marthaamay: Glad you tried to last year! Good luck this year, you can do it. It's easier than it seems. I don't do it as a challenge but I do not like to buy new things in many areas. Sooner or later most of the things I want/need show up at a yard sale for a fraction of the store cost. Deana: Yep, doing this challenge has taught to be patient to save. I used to go retail when I needed something like a rug or a bookshelf, now I wait patiently for the right one to pop up at a yard sale, thrift store, or flea market stall. My partner and I simply went along to start to see the film The Social-Network last weekend. the window room. Guaranteed, using snapshots is just plain enjoyment.